Margaret Hilda Thatcher, Baroness Thatcher, LG, OM, PC, FRS (October 13, 1925 - April 8, 2013) was Prime Minister of the United Kingdom from 1979 to 1990, and leader of the Conservative Party from 1975-1990. She was the longest-serving British Prime Minister in the twentieth century, the longest since William Gladstone, and had the longest continuous period in office since Lord Liverpool. She was also the only woman to become prime minister or elected leader of a major political party in the Britain. One of the most significant British politicians in recent political history, nicknamed the "Iron Lady," Lady Thatcher was also one of the most divisive, being loved and loathed in equal measure. This may have been the result of the firm stands she took on tough and complex issues. On one hand, the consequences of some of her policies severely affected the lives of many hard-working Britons. On the other hand, successive governments have continued her policy of lower taxation, and of encouraging citizens to exercise choice in buying services over which they previously had no say, as they had been state-provided. She is especially remembered for Britain's successful Falklands War and for her close friendship with U.S. President Ronald Reagan, with whom she shared a similar domestic policy philosophy as well as tough stance against the Soviet Union. Her hard-line defense policy coupled with her willingness to "do business" with Soviet president Mikhail Gorbachev contributed toward the collapse of the Soviet empire and end of the Cold War. Overall, Lady Thatcher gave British citizens a new sense of their place in the world. Margaret Thatcher was born Margaret Hilda Roberts in the town of Grantham in Lincolnshire in eastern England to Alfred Roberts and Beatrice Roberts née Stephenson. She had one sister, Muriel. Her father was a grocer and activist in local politics, serving as an Alderman until 1946. He was also a Methodist lay preacher. Thatcher was brought up a staunch Methodist and has remained a Christian throughout her life. Margaret was a good student. She attended a girls' grammar school (Kesteven) and then Somerville College, Oxford, from 1944, where she studied chemistry. She became president of the Oxford University Conservative Association in 1946. After graduating from college, Thatcher worked as a research chemist for British Xylonite and then for J. Lyons and Co., where she helped develop methods for preserving ice cream. She was a member of the team that developed the first soft frozen ice cream. At the 1950 and 1951 elections, as the youngest woman Conservative candidate, Margaret Roberts fought the safe Labour Party seat of Dartford. Her activity in the Conservative Party in Kent brought her into contact with Denis Thatcher (later Sir Denis), whom she married, in 1951. Denis was a millionaire businessman who made his fortune in the oil industry. He funded his wife's study of law. She qualified as a barrister in 1953, the same year that her twin children, Carol and Mark (now Sir Mark Thatcher), were born. As a barrister, she specialized in tax issues. But she had definite political aspirations. Thatcher sought candidacy for a safe Conservative seat, and was narrowly rejected for Orpington in 1954. She was rejected several more times before her selection for Finchley in April 1958. She won the seat in the British House of Commons easily in the 1959 election. Her maiden speech supported her Private Member's bill to force local councils to hold meetings in public, which passed. Margaret was promoted early to the front bench as Parliamentary Secretary at the Ministry of Pensions and National Insurance in September 1961, keeping the post until the Conservatives lost power in the 1964 election. When Sir Alec Douglas-Home stepped down, Thatcher voted for Sir Edward Heath in the leadership election over Reginald Maudling, and was rewarded with the job of Conservative spokesman on Housing and Land. She moved to the Shadow Treasury Team after 1966. Thatcher was one of few Conservative MPs to support Leo Abse's bill to decriminalize male homosexuality, and she voted in favor of Liberal Party leader David Steel's bill to legalize abortion. However, she was opposed to the abolition of capital punishment and voted against making divorce more easily attainable. She made her mark as a conference speaker in 1966 with a strong attack on the taxation policy of the Labour Government as being steps "not only towards Socialism, but towards Communism." She won promotion to the Shadow Cabinet as Shadow Fuel Spokesman in 1967, and was then promoted to shadow Transport and, finally, Education before the 1970 election. When the Conservatives won the 1970 general election, Thatcher became Secretary of State for Education and Skills. In her first months in office, forced to cut the Education budget, she decided to abolish universal free milk in schools while simultaneously defending the budget of the Open University against cuts. This provoked a storm of public protest. Her term was marked by proposals for more local education authorities to abolish grammar schools, and adopt comprehensive secondary education. Thatcher supported the plan even though this was considered a left-wing policy. After the Conservative defeat in February 1974, she was promoted to Shadow Environment Secretary. Her focus became promoting the abolition of the rating system that paid for local government services, which proved popular within the Conservative Party. She agreed with Sir Keith Joseph that the Heath Government had lost control of monetary policy. After Heath lost the UK general election in October 1974, he could not continue as Conservative Party leader without a contest. Joseph opted to drop out of the race, Thatcher decided to enter it. Unexpectedly, she out-polled Heath on the first ballot and won the job on the second in February 1975. She appointed Heath's preferred successor William Whitelaw as her deputy. The Russians are bent on world dominance, and they are rapidly acquiring the means to become the most powerful imperial nation the world has seen. The men in the Soviet Politburo do not have to worry about the ebb and flow of public opinion. They put guns before butter, while we put just about everything before guns. In response, the Soviet Defense Ministry newspaper Red Star nicknamed her the "Iron Lady." She took delight in the name, which became associated with her image as unwavering and steadfast. Throughout her administrations, Thatcher sought to have a cabinet that reflected the broad range of opinions in the Conservative Party. She worked carefully to convert the Conservative Party to her monetarist beliefs. In an interview with Granada Television's World in Action program in 1978, she expressed concerns about immigrants "swamping" the UK, arousing controversy. Her sentiments were viewed by some as drawing supporters of the British National Front to the Conservative fold. During the 1979 General Election, most polls showed voters preferring Labour's James Callaghan as Prime Minister. The Labour Government had difficulties with industrial disputes, strikes, high unemployment, and collapsing public services during the winter of 1978-1979, dubbed the "Winter of Discontent." The Conservatives used campaign posters with slogans such as "Labour Isn't Working" to attack the government's record on unemployment and perceived over-regulation of the labor market. The Callaghan government fell after a motion of no confidence in spring 1979. Following the general election, the Conservatives won a working majority in the House of Commons and Thatcher became the United Kingdom's first woman Prime Minister. Thatcher formed a government on May 4, 1979, with a mandate to reverse the UK's economic decline and reduce the state's role in the economy. Thatcher was incensed by one contemporary view within the Civil Service that its job was to manage the UK's decline from the days of Empire. She wanted the country to assert a higher level of influence and leadership international affairs. She would not settle for this defeatist attitude. She was a philosophic soulmate of Ronald Reagan, elected in 1980 in the United States, and to a lesser extent Prime Minister Brian Mulroney, elected in 1984 in Canada. Their form of conservatism was to be the dominant political philosophy in the major English-speaking nations for the era. In May 1980, one day before she was due to meet the Irish Taoiseach, Charles Haughey to discuss Northern Ireland, she announced in the House of Commons that "the future of the constitutional affairs of Northern Ireland is a matter for the people of Northern Ireland, this government, this parliament and no-one else." In 1981 a number of Provisional Irish Republican Army (IRA) and Irish National Liberation Army prisoners in Northern Ireland's Maze prison (known in Ireland as "Long Kesh," its previous name) went on hunger strike to regain the status of political prisoners, revoked five years earlier. Bobby Sands, the first of the strikers, was elected as a Member of Parliament for the constituency of Fermanagh and South Tyrone a few weeks before he died. At first, Thatcher refused to consider a return to political status for republican prisoners, declaring "Crime is crime is crime; it is not political." However, after nine more men starved themselves to death, and in the face of growing anger and civil unrest, some rights were restored. Thatcher also continued the policy of "Ulsterisation" of the previous Labour government, believing that the unionists of Northern Ireland should be at the forefront in combating Irish republicanism. This relieved the burden on the British army and elevated the role of the Ulster Defence Regiment and the Royal Ulster Constabulary. In economic policy, Thatcher began increasing interest rates to decrease money supply. She preferred indirect taxation over taxes on income. Value added tax (VAT) was raised sharply to 15%, resulting in increased inflation. These moves hit businesses, especially the manufacturing sector. Unemployment quickly passed two million people. Political commentators harked back to the Heath Government's "U-turn," speculating that Mrs. Thatcher would follow suit. She repudiated this at the 1980 Conservative Party conference, saying, "To those waiting with bated breath for that favorite media catch-phrase—the U-turn—I have only one thing to say; you turn if you want to, the Lady's not for turning." Her conviction was confirmed in the 1981 budget, when, despite concerns expressed in an open letter from 364 leading economists, taxes were increased in the middle of a recession. In January 1982, the inflation rate dropped to single figures and interest rates were then allowed to fall. Unemployment continued to rise, reaching an official figure of 3.6 million. British defense budget cuts provoked the most difficult foreign policy decision of Thatcher's tenure. In Argentina, an unstable military junta was in power and keen on reversing its widespread unpopularity, caused by the country's poor economic performance. On April 2, 1982, it invaded the Falkland Islands, the only invasion of a British territory since World War II. Argentina has claimed the islands since an 1830s dispute on their settlement. Within days, Thatcher sent a naval task force to recapture the Islands, which was successful, resulting in a wave of patriotic enthusiasm for her. 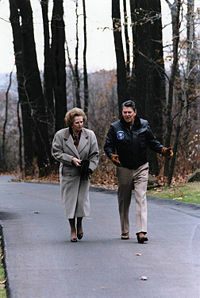 Ronald Reagan and Margaret Thatcher at Camp David. This "Falklands Factor," along with disunity among opposition, was a major factor in the wide Conservative majority in the June 1983 general election, a political high point for the Thatcher government. Aiming to take advantage of the Labour split, there was a new challenge to the political center. In the early 1980s, the SDP-Liberal Alliance, formed by an electoral pact between the SDP and the Liberal Party, aimed to break the major parties' dominance and win proportional representation. However, this uneasy partnership failed to break through. The Conservatives won 42.4 percent of the vote in 1983. However, the split opposition, combined with Britain's first past the post electoral system—in which marginal changes in vote numbers and distribution often have disproportionate effects on the number of seats won—translated this vote share into a Conservative landslide. Margaret Thatcher had won. Thatcher was committed to reducing trade union power through incremental change. Several unions launched strikes that were aimed at damaging her politically. The most significant of these was carried out, in 1984-85, by the National Union of Mineworkers (NUM). Showing wise foresight, Thatcher had made preparations long in advance for an NUM strike by building up coal stocks. There were no cuts in electricity supply, unlike 1972. Police tactics during the strike concerned civil libertarians, but images of crowds of militant miners using violence to prevent other miners from working swung public opinion against the strike. The Miners' Strike lasted a full year before the NUM leadership conceded without a deal. The Tory government then went on to close all but 15 pits, before privatization in 1994. In June 1984, Thatcher invited apartheid South Africa's president, P.W. Botha, and foreign minister, Pik Botha, to Chequers (the prime minister's official country residence) in an effort to stave off growing international pressure for economic sanctions against South Africa, where Britain had invested heavily. The visit came just three months after four South African arms smugglers had been arrested in Coventry and charged with offenses against the United Nations mandatory arms embargo outlawing the export of arms to South Africa. Early morning October 12, 1984, the day before her 59th birthday, Thatcher narrowly escaped the Brighton Hotel bombing by the Provisional Irish Republican Army during the Conservative Party conference. Five people died in the attack, including Roberta Wakeham, wife of the government's Chief Whip John Wakeham, Baron Wakeham, and the Conservative MP Sir Anthony Berry. A prominent member of the Cabinet, Norman Tebbit, was injured, along with his wife Margaret, who was left paralyzed. Thatcher herself would have been killed, if not for the fact that she was using the bathroom at the time the IRA bomb detonated. Thatcher insisted the conference open according to schedule and made her speech as planned in defiance of the bombers, an act which won widespread approval. On November 15, 1985, Thatcher signed the Hillsborough Anglo-Irish Agreement, the first acknowledgment by British government that the Republic of Ireland had an important role to play in Northern Ireland. The agreement was greeted with fury by Irish unionists. The Ulster Unionist Party and Democratic Unionist Party made an electoral pact and on January 23, 1986, staged an ad-hoc referendum by resigning their seats and contesting the subsequent by-elections. However, unlike the Sunningdale Agreement of 1974, they found they could not bring the agreement down by a general strike. This was evidence of a changed balance of power in industrial relations. Thatcher's economic philosophy emphasized free markets and entrepreneurialism. Since gaining power, she experimented by selling off a small nationalized company, the National Freight Company, to its workers, with a surprisingly positive outcome. After the 1983 election, the Government became bolder and sold off most of the large utilities, publicly owned since the late 1940s. Many people took advantage of share offers. The policy of privatization has become synonymous with Thatcherism. In the Cold War, Mrs. Thatcher supported Ronald Reagan's policies of deterrence against the Soviets. This contrasted with the policy of détente the West had pursued during the 1970s, and caused friction with allies still committed to détente. Mrs. Thatcher permitted U.S. forces to station nuclear cruise missiles at British bases, arousing mass protests by the Campaign for Nuclear Disarmament. Later, she was the first Western leader to respond warmly to the rise of reformist Soviet leader Mikhail Gorbachev. She declared that she liked him, describing him as "a man we can do business with." Thatcher outlasted the Cold War, which ended in 1989, and voices who share her views on it credit her with a part in the West's victory, through both deterrence and détente. Also in 1985, the University of Oxford voted to refuse Thatcher an honorary degree in protest against her cuts in funding for education. Previously, this award had always been given to Prime Ministers that had been educated at Oxford. She supported the U.S. bombing raid on Libya from bases in the UK in 1986 in defiance of other NATO allies. In 1986 her government created controversy by abolishing the Greater London Council (GLC), led by left-winger Ken Livingstone, and six Metropolitan County Councils (MCCs). The government claimed this was an efficiency measure. However, Thatcher's opponents believed the move was politically motivated, because all the abolished councils were controlled by Labour, had become powerful centers of opposition to her government, and were in favour of higher public spending by local government. In 1984, she visited China and signed the Sino-British Joint Declaration with Deng Xiaoping on 19 December, which committed the People's Republic of China to award Hong Kong the status of a "Special Administrative Region." Under the terms of the so-called One Country, Two Systems agreement, China was obliged to leave Hong Kong's economic status unchanged after the handover on July 1, 1997 for a period of 50 years – until 2047. At the Dublin European Council in November 1979, Thatcher argued that the United Kingdom paid far more to the European Economic Community than it received in spending. She declared at the summit: "We are not asking the Community or anyone else for money. We are simply asking to have our own money back." Her arguments were successful. At the June 1984 Fontainbleau Summit, the EEC agreed on an annual rebate for the United Kingdom, amounting to 66 percent of the difference between Britain's EU contributions and receipts. This still remains in effect and occasionally causes some political controversy among the members of the European Union. By winning the 1987 general election, on the economic boom and against a generally anti-nuclear Labour opposition, with a 102 majority, she became the longest continuously serving Prime Minister of the United Kingdom since Robert Banks Jenkinson, 2nd Earl of Liverpool (1812 to 1827), and the first to win three successive elections since Henry Temple, 3rd Viscount Palmerston in 1865. Though an early backer of decriminalization of male homosexuality, Thatcher issued the statement that "children who need to be taught to respect traditional moral values are being taught that they have an inalienable right to be gay," at the 1986 Conservative party conference. Hard welfare reforms in her third term created an adult Employment Training system that included full-time work in exchange for the dole, based on the workfare model from the U.S. In 1988, Thatcher made a major speech accepting the problems of global warming, ozone depletion, and acid rain.,In 1990, she opened the Hadley Centre for climate prediction and research. In her book Statecraft (2002), she described her later regret in supporting the concept of human-induced global warming, outlining the negative effects she perceived it had upon the policymaking process. "Whatever international action we agree upon to deal with environmental problems, we must enable our economies to grow and develop, because without growth you cannot generate the wealth required to pay for the protection of the environment." At Bruges, Belgium in 1988, Thatcher made a speech opposing proposals from the European Community for a federal structure and centralization of decision-making. 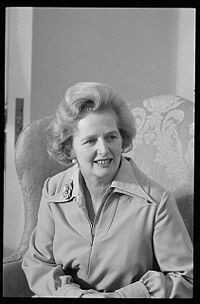 Although she supported British membership, Thatcher believed the role of the EU should be limited to ensuring free trade and effective competition. She feared that new EU regulations would reverse gains she was making for the UK. "We have not successfully rolled back the frontiers of the state in Britain, only to see them reimposed at a European level, with a European superstate exercising a new dominance from Brussels." She was specifically against EU monetary union, through which a single currency would replace national currencies, and for which the EC was making preparations. The speech caused an outcry from other European leaders, and exposed the deep split emerging over European policy within her Conservative Party. Thatcher's popularity declined again in 1989 as the economy suffered from high interest rates imposed to stop an unsustainable boom. She blamed her Chancellor, Nigel Lawson, who had been following an economic policy which was a preparation for monetary union. At the Madrid European summit, Lawson and Foreign Secretary Geoffrey Howe forced Thatcher to agree on circumstances under which she would join the Exchange Rate Mechanism, a preparation for monetary union. Thatcher took revenge on both by demoting Howe and by listening more to her adviser Sir Alan Walters on economic matters. Lawson resigned that October. In November, Thatcher was challenged for the leadership of the Conservative Party by Sir Anthony Meyer. Meyer was a virtually unknown backbench MP, so he was viewed as a stalking horse candidate for more prominent members of the party. Thatcher easily defeated Meyer's challenge, but there were 60 ballot papers either cast for Meyer or abstaining, a surprisingly large number for a sitting Prime Minister. Problems emerged during implementation of the poll tax to fund local government when many of the tax rates set by local councils proved to be much higher than earlier predictions. A large London demonstration against the Community Charge on March 31, 1990—the day before it was introduced in England and Wales—turned into a riot. Millions of people resisted paying the tax. Opponents of the poll tax banded together to resist bailiffs and disrupt court hearings of poll tax debtors. Thatcher refused to compromise on the tax, and its unpopularity was a major factor in her downfall. One of her final acts in office was to pressure U.S. President George H. W. Bush to deploy troops to the Middle East to drive Saddam Hussein's army out of Kuwait. Bush was somewhat apprehensive about the plan, but Thatcher convinced him that this was "no time to go wobbly!" On the Friday before the Conservative Party conference in October 1990, Thatcher ordered her new Chancellor of the Exchequer John Major to reduce interest rates by 1 percent. Major persuaded her that the only way to maintain monetary stability was to join the Exchange Rate Mechanism at the same time, despite not meeting the Madrid conditions. The Conservative Party conference that year saw a large degree of unity; few who attended could have imagined that Mrs. Thatcher had only a matter of weeks left in office. By 1990, opposition to Thatcher's policies on local government taxation, her Government's perceived mishandling of the economy (especially high interest rates of 15 percent, which were undermining her core voting base within the home-owning, entrepreneurial and business sectors), and the divisions opening within her party over the appropriate handling of European integration made her and her party increasingly politically vulnerable. A challenge was precipitated by the resignation of Sir Geoffrey Howe on November 1, 1990. Upon returning to London, Thatcher consulted her cabinet colleagues. A large majority believed there was a good possibility she would not win a new round of elections. On November 22, after having fallen short of a clear win in a first round of voting, Thatcher announced to her cabinet that she would not seek candidacy in the second ballot, bringing her term of office to an end. She stated, "Having consulted widely among my colleagues, I have concluded that the unity of the Party and the prospects of victory in a General Election would be better served if I stood down to enable Cabinet colleagues to enter the ballot for the leadership. I should like to thank all those in Cabinet and outside who have given me such dedicated support." Thatcher supported John Major as her successor. He duly won the leadership contest. After her resignation, a MORI poll found that 52 percent agreed that "On balance she had been good for the country," with 44 percent maintaining she had been "bad". She retired from the House of Commons at the 1992 election. In 1992, Margaret Thatcher was raised to the peerage by the conferment of the life barony of Thatcher, of Kesteven in the County of Lincolnshire, upon her. Thatcher chose not to take a hereditary title. She has explained that she did not think she had sufficient means to support a hereditary title. This shows a measure of humility in the face of the magnitude of leadership she provided for her country. By virtue of the life barony, she entered the House of Lords. She made a series of speeches in the Lords criticizing the Maastricht Treaty (the treaty establishing the European Union, signed in 1992). This was the first time she stood against the party line since 1961. She described it as "a treaty too far." In June 1993, Thatcher told the Lords: "I could never have signed this treaty." She also advocated a referendum on the treaty, citing A. V. Dicey, believing that the people should have their say. In August 1992 she called for NATO to stop the Serbian assault on Gorazde and Sarajevo in order to end ethnic cleansing and to preserve the Bosnian state. She claimed what was happening in Bosnia was "reminiscent of the worst excesses of the Nazis". In December of that same year she warned that there could be a holocaust in Bosnia. After the first massacre at Srebrenica in April 1993, Thatcher thought it was a "killing field the likes of which I thought we would never see in Europe again." She was honored by the Queen in 1990, shortly after her resignation as Prime Minister, when she was appointed to the Order of Merit, one of the UK's highest distinctions. In addition, her husband, Denis, was given a baronetcy in 1991 (ensuring that their son Mark would inherit a title). This was the first creation of a baronetcy since 1965. In 1995 Thatcher was raised to the Order of the Garter, the United Kingdom's highest order of Chivalry. In July 1992, she was hired by tobacco giant Philip Morris Companies (now the Altria Group) as a "geopolitical consultant" for US$250,000 per year and an annual contribution of US$250,000 to her foundation. From 1993 to 2000, she served as Chancellor of the College of William and Mary, one of the oldest universities in North America, in Williamsburg, Virginia, established by royal charter in 1693. She was also Chancellor of the University of Buckingham, the UK's only private university. She retired from the post in 1998. She wrote her memoirs in two volumes, The Path to Power and The Downing Street Years. In later years she wrote several more books on politics and foreign affairs. Although she remained supportive of John Major's policies in public, in private she made her displeasure known. Her views were conveyed to the press and widely reported. In 1998, Thatcher made a highly publicized visit to the late Chilean dictator Augusto Pinochet, while he was under house arrest in Surrey. During the visit, she expressed her support and friendship to him. Pinochet had been a key ally in the Falklands War. During the same year, she made a £2,000,000 donation to Cambridge University for the endowment of a Margaret Thatcher Chair in Entrepreneurial Studies. She also donated the archive of her personal papers to Churchill College, Cambridge. Through 2001 Thatcher maintained a full schedule of international speaking engagements. She also actively supported the Conservative election campaign that year. However, on March 22, 2002, her doctors told her to stop making public speeches on health grounds. She had suffered several small strokes, which left her in a very frail state. She remained active in various Thatcherite groups, including the Conservative Way Forward group, the Bruges Group and the European Foundation. Mrs. Thatcher and her husband, Denis, were an excellent team, and her career was one in which a balance between the roles of husband and wife was achieved. Her husband's public role was in the background, but in business he was highly successful. He advised his wife on many issues which she herself fully acknowledged, commenting that he chose to keep a low public profile so that he could fully support her behind the scenes. Denis Thatcher passed away on June 26, 2003. On June 11, 2004, Thatcher delivered a moving tribute via videotape to former President Ronald Reagan at his state funeral at the National Cathedral in Washington, D.C.. Later that day, she personally attended his funeral in Simi Valley, California. On October 13, 2005, Thatcher marked her 80th birthday with a party at the Mandarin Oriental Hotel in Hyde Park, London. Guests included Her Majesty the Queen and HRH The Duke of Edinburgh. At the party Geoffrey Howe, now Lord Howe of Aberavon, assessed her political career by saying, "Her real triumph was to have transformed not just one party but two, so that when Labour did eventually return, the great bulk of Thatcherism was accepted as irreversible." Thatcher died on the morning of April 8, 2013 after suffering a stroke. In accordance with her wishes there was no state funeral. Instead, she received a funeral with full military honors and a ceremony in London's St Paul's Cathedral on April 17. Queen Elizabeth II attended the service together with her husband, the Duke of Edinburgh, as did British Prime Minister David Cameron and his wife, and numerous other dignitaries. Margaret Thatcher was a person who was not afraid of taking a stand even on controversial issues. British citizens tended to either strongly support her or strongly disagree with her. Consequently, there are divergent views on her legacy. Some credit her macroeconomic reforms with rescuing the British economy from the stagnation of the 1970s and admire her committed radicalism on social issues. Others see her as authoritarian and egotistical. She has been accused of dismantling the welfare state and destroying much of the UK's manufacturing base, while consigning millions to long-term unemployment. Yet, the UK was widely seen as the sick man of Europe in the 1970s. Some argued that it would be the first developed nation to return to the status of a developing country. Instead, the UK emerged as one of the most successful economies in modern Europe. Her supporters claim that this was due to Margaret Thatcher's policies. In the end, few could argue that there was any woman who played a more significant role on the world stage in the twentieth century. In perhaps the sincerest form of flattery, Labour Prime Minister, Tony Blair, himself a thrice-elected prime minister, acknowledged her importance by continuing many of her economic policies. Thatcher indirectly acknowledged Blair during a Conservative leadership contest when she said "They… [the Conservative Party]… don't need someone that can beat Mr. Blair, they need someone like Mr. Blair." As a conservative, Thatcher emphasized the importance of families and individuals in the fabric of British life. In conservative circles, Thatcher is often remembered with fondness as someone who dared to confront powerful unions and remove harmful constraints on the economy. Many on both the right and left agree that Thatcher had a transformative effect on the British political spectrum. Her tenure had the effect of moving the major political parties rightward. New Labour and Blairism have incorporated much of the economic, social and political tenets of "Thatcherism." In the same manner, in a previous era, the Conservative Party from the 1950s until the days of Edward Heath accepted many of the basic assumptions of the welfare state instituted by Labour governments. The curtailing and large-scale dismantling of elements of the welfare state under Thatcher have largely remained. Also, Thatcher's program of privatizing state-owned enterprises has been maintained. Successive Tory and Labour governments have further curtailed the involvement of the state in the economy and have further dismantled public ownership. The policy of privatization was taken up by all former communist countries in eastern Europe and much of the former Soviet Union as the way to dismantle communism and establish a free market economy. In that sense she also had a lasting transformational influence over much of the world. Thatcher's legacy has continued to influence the Conservative Party strongly. Successive leaders, starting with John Major, and continuing with William Hague, Iain Duncan Smith and Michael Howard, have struggled with real or imagined factions in the Parliamentary and national party to determine what parts of her heritage should be retained or jettisoned. In a list compiled in 2006 by the left-leaning magazine, the New Statesman, Mrs. Thatcher was voted fifth in the list of "Heroes of Our Time." ↑ Margaret Thatcher, Speech to the Royal Society September 27, 1988 Retrieved April 23, 2013. ↑ Margaret Thatcher, Speech opening Hadley Centre for Climate Prediction and Research May 25, 1990. Retrieved April 23, 2013. ↑ Margaret Thatcher, Statecraft: Strategies for Changing World (New York: HarperCollins, 2002, ISBN 0060199733), 452. ↑ Dennis Kavangah, The Reordering of British Politics: Politics after Thatcher. (Oxford University Press, 1997), 134. ↑ Margaret Thatcher, HL S (European Communities (Amendment) Bill) June 7, 1993. Retrieved August 29, 2008. ↑ John Campbell, Margaret Thatcher: The Iron Lady (Jonathan Cape, 2003), 769. ↑ Thatcher stands by Pinochet BBC News, March 26, 1999. Retrieved April 9, 2013. ↑ Ex-Prime Minister Baroness Thatcher dies, aged 87 BBC News, April 8, 2013. Retrieved April 9, 2013. ↑ Margaret Thatcher's funeral in pictures BBC News, April 17, 2013. Retrieved April 22, 2013. ↑ Jason Cowley, "Heroes of our time - the top 50" New Statesman, May 22, 2006. Retrieved June 5, 2008. All links retrieved August 14, 2018. This page was last modified on 14 August 2018, at 15:48.